It is hard and mucky work but what emerges from the heat and the dirt could and, indeed does, grace the finest tables in the land. For the gently spoken alchemist who emerges from his well-ordered workshop tucked away at the back of an industrial estate in Sturminster Marshall is Nick Stevenson, Her Majesty’s tinsmith. As recommendations go the unmistakable crest and those hard-earned words ‘By Appointment to…’ are unsurpassed. Copper bottomed in fact. 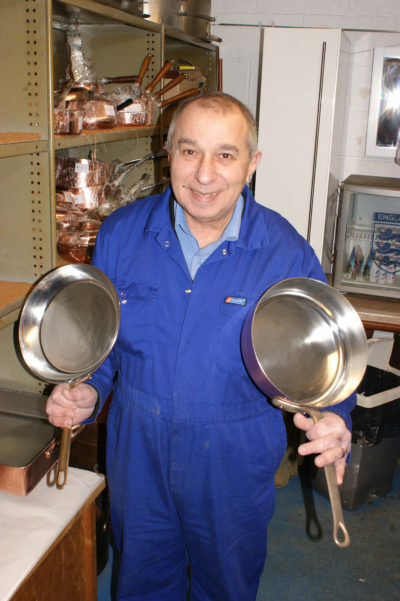 Appropriately so as Nick has re-tinned the Royal household’s copper cooking pots and pans for more than 25 years. That Nick, a fourth generation tinsmith, works in the old-fashioned way using a hand-wipe finish is no surprise – it’s what got him the Royal job in the first place. ‘This was the early 1990s and Buckingham Palace was not really into modern ways of doing things in those days,’ he says, smiling as he recalls the day a well-spoken gentleman had called to ask if he would come to central London to discuss re-tinning some copper cookware. ‘I was friendly with a woman at the Savoy Hotel and had done some work for her. I didn’t realise at the time but she knew this person at Buckingham Palace and when he asked if she knew of anyone who could re-tin copper pots she recommended me. At the subsequent meeting Nick was asked a lengthy series of questions then invited to meet the then Royal chef, a stern-faced man who took the business of cooking with copper extremely seriously. Within weeks that’s exactly what Nick was doing. 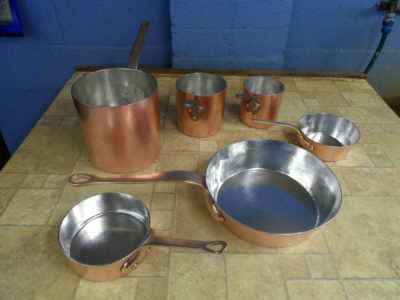 He asked for all the pots and pans to be properly measured so as to provide an accurate quote and within a few years he was working without the need to quote in advance. ‘I must have been into my sixth year of working for Buckingham Palace, by which time the chef and I had become good friends, before I plucked up the courage to ask him how I would go about getting a Royal Warrant. He immediately made some phone calls and the form arrived a week or so later. There were about 20 pages of questions, including one that asked if I had ever been a terrorist. His pride is undiminished by the passing of time – ‘I would be distraught if it was taken away,’ he says. Every five years his work is reviewed but providing he continues to deliver high quality work in a timely fashion Nick can reasonably expect to hold the Warrant indefinitely. He has worked on Prince Philip’s personal sauté pan and hundreds of historic pots, the oldest dating from 1736, from all the Royal residencies. However, there doesn’t appear to be a fifth generation waiting in the wings to take up Nick’s work. ‘I was a young man once and I got fed up with tinning and went to work in other areas. We moved to Poole in 1982. I set up this business in 1985 and it was tough, I didn’t pay myself any wages for the first six months. I’m nearly seventy now and I can’t do this forever, but neither of our two boys is interested. It takes time to prepare a pan for tinning. First it must sit in a degreasing tank for a day or two to remove the carbon and baked on residues. Then it is washed and hammered out on the anvil so that the bottom presents a flat surface to the stove before a scurf mop on the polisher is used to remove the old tin. 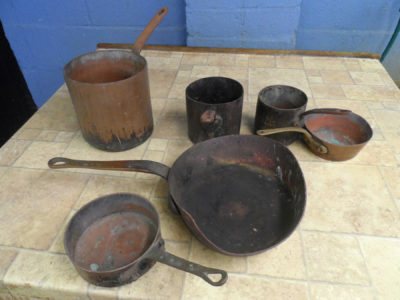 The pan is soaked in pickling acid for 12 hours and washed again and a barrier cream applied to the top of the outside edge to prevent the molten tin dripping down the side. Then it is heated to around 500˚F before a tin ingot is melted around the inside and smoothed with wool before being quenched in water.